Situated next to the River Severn with great views across open space, this building is conveniently placed in the town centre just moments from the railway station. The building provides shared and private office space that is ideal for start-ups. 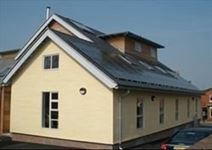 The building has many sustainability features including solar panels. The workspace has been refurbished to allow low cost, manageable accommodation suitable for all businesses. With a wide range of trades already on the development, this flexible workspace is perfect for any aspiring business wanting to work in the modern workplace. With 24 hour access and on-site parking, monitored by 24/7 security, this site operates as a perfect base to thrive in business. Located close to all local amenities, including gyms, restaurants, cafes, bars and shops, there's plenty to do in your out of office activities. Wem itself is located in the heart of the North Shropshire Plain, close to the A49. From here, you have great access to a number of the surrounding towns, including Shrewsbury, Crewe, Wrexham, Telford and all of South Wales.